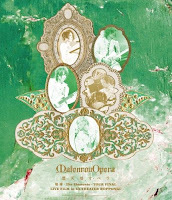 MATENROU OPERA Announces Mini-Album + Digest DVD | VKH Press – J-Rock & Visual Kei Coverage Worldwide! MATENROU OPERA have recently announced a new mini album and live DVD! The mini-album PHOENIX RISING will be released on October 19th for ¥2,200¥ (tax incl). Depending on the store you purchase or pre-order the mini-album from, a special limited bonus will be included: an original A3 size poster OR a video comment DVD! The digest DVD and Blu-ray will be released on August 31st for ¥6,300 and ¥5,800 (tax not incl.) respectively. The DVD will live feature footage from their concert at EX THEATER ROPPONGI on May 4th, Chikyuu –The Elements - TOUR FINAL. The DVD will also feature off-shot footage of MATENROU OPERA in Toronto, CN at Anime North on a separate disc and include a special booklet. The Blu-Ray will only feature the EX THEATER ROPPONGI concert and 3 song encore.